On the other side of the road was a market. It had a roof and side walls but no wall front or back. The stalls, for the most part, had nothing but fruit and vegetables and were staffed by Indian people. There was a long room down one side that stunk of fish and had fridges and displays much as you’d find here in Australia. We wandered up and down the fruit and vegetable tables, viewing the wares but not standing still long enough for anyone to think we were going to buy. We always look for the friendliest face as much as the goods they’re selling and then come back to that one. 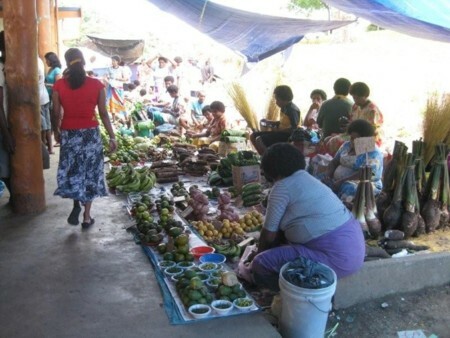 At the back of the market, seated on the floor and with only tarps strung overhead to protect them from the sun, were the Fijian people. They had all of their fruit stacked up in a really interesting way. Not entirely sure how they stacked things like limes 4 high but it was a cute custom. We saw some small breadfruit and decided to buy one. From the look of it we thought it would be something like a durian or jackfruit. It only cost $1 anyway. I asked the lady if it was ready to eat but she didn’t understand me so I repeated it more slowly, ready to try ‘ripe?’ if that had failed but the lady at the next stall understood me and said ‘yes!’ Then we went back to the friendliest Indian face we had seen and bought 3 small pineapples for 50c each. She also gave us a $1 sized one for free which was lovely of her. And that was the shopping strip done. We decided to walk back on the side of the road we were now on and discovered that this side was not all bush as it had partially appeared from the shop side. There were several schools, some para-airport businesses and a mosque. It’s not that we’re totally dumb and missed these on the way ‘up’, it’s that we were now walking along next to the bushes and could now see through them to what was hidden behind. The footpath was narrow and overgrown but Fiji was so lush that things would grow very fast so it’s possible it gets cleared from time to time. Fiji was not hot by any means but the humidity was constantly pretty high. We adored that the temperature did not drop at night and that it was consistently such a pleasant warmth. Once we arrived back at the hotel we were quite warm so put the fruit in our room and changed into our bathers and headed off for a swim. The hotel pool was really big but there was only one young woman swimming in it. In fact the entire hotel did not seem very busy during our first night there (before the island stay) or on our current 2 nights. We had a few friendly words with the girl but didn’t want to intrude so just enjoyed our cool-off together. Perhaps because of the size of the pool, or because of the massive tree which partially shaded it, we got cool fairly quickly and were happy to get out and dry off. We went back to our room and had a nice shower and rinsed our bathers out as well. 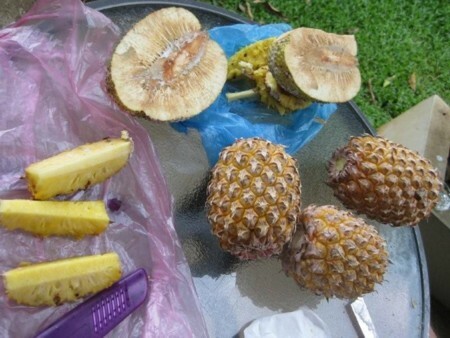 the pineapples and curiously cut open the breadfruit. It was pure white and a fairly ‘solid’ texture. David cut a slice and handed it to me and I bit into what may as well have been rubber. I shook my head and gave the slice to him but he declined a taste. Within a minute the fruit had started to go brown. Since coming home and reading up on good old Google it seems that breadfruit have to be cooked. Oh well, for $1 we had seen the inside of one. We also ate the pastries we’d ‘rescued’ at breakfast. According to one of the brochures there was a town nearby called Port Denarau and, seeing as this was our only full day on the mainland we decided we’d get a taxi and go to see this. It was alleged to have a shopping centre and be an attraction so we asked at reception and she rang for a taxi for us. It took oh… 30 seconds to arrive? OK, I’ll be truthful, it took 2 minutes. The driveway of the hotel would have taken that long to drive down!!! The car was really shoddy and knocked about, the driver was not wearing a seatbelt and it was obvious that the ones in the back had not been used for a very long time – the buckles were nowhere to be seen – so we didn’t bother. 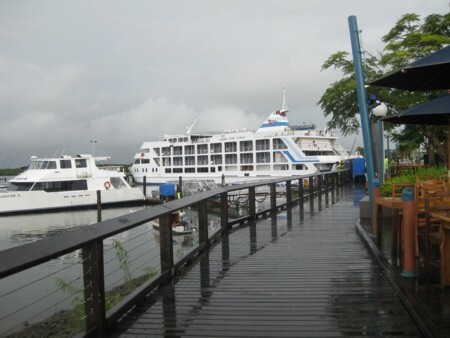 We drove through Nadi where we’d walked this morning and it started to drizzle, then rain a little. Nothing to worry about. We continued on the main road stopping regularly to go really slowly over potholes and then speeding up again, and the rain got a bit heavier. At one point we turned right, went along a bit and then turned left, then right onto what could only possibly have been the road we’d turned off of in the first place. The driver chatted a bit with us though he had his radio on too and the CB was not quiet for long either. When he was on the CB he spoke (I presume) in Hindi as we didn’t understand any of it. After passing Nadi we drove through an area sparsely housed with some trees and lots of open but rough terrain grassed land. There was also a roadside swamp – though it was prettier than that word sounds. Like a very shaded small lake with trees surrounding and dotted through it. Then we turned into another road through 2 large brick walls which announced ‘Denarau’. The road here was brick paved with occasional large ornamental roundabouts. Each of these heralded a gateway to a housing area, each with a different estate name. Each estate had a metal gate which was closed. 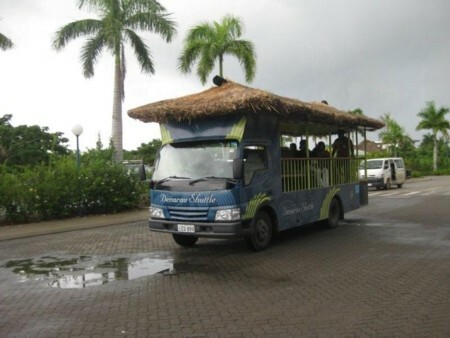 Soon we saw the shopping centre and the first thing we noticed was that their shuttle buses were thatched. I kid you not!!! We found out later that these buses deliver people to the housing estates we’d just come through. We paid the taxi driver with a $50 note for a $25 fare and he left us standing while he went into a shop to get change. We thought we’d been dumped (and doubted we could have recouped our $25 by selling the taxi LOL) but he did eventually turn up with the change. In the first shop, Jacks of Fiji, we were greeted by a really gorgeous Indian lad. Very friendly and extremely handsome too! But it was one of those shops where you get escorted personally. He introduced himself and even told us his name and said that he was our ‘host for the afternoon’ or some similar wording. Eeekkk!!!! It was an interesting shop and the things that most stood out for me were the turned-wood urns and bowls, they were so beautiful. A smallish one was $350 and the large ones were ‘if you need to ask you can’t afford them’. They had lots of souvenir items such as the ever-present ceremonial kava bowls and other wooden knick knacks and woven leaf items. Also there was lots of clothing, some of which was gorgeous, but very pricey. The lad began to realise we’d told the truth when we had told him we were just looking so when a girl spoke to him he stayed with her, phew! We’d just finished in this shop when it started to rain pretty hard. The shopping centre was only partially covered; I suppose it was best described as each shop having a verandah so we huddled around under these to keep dry. The centre was not finished yet though most of the shops on the ground level were occupied. There was a real estate agent, newsagent, helicopter tour booking agent, a *lot* of cafes and restaurants – well, for the size of the place anyway, which really wasn’t that big. There was a Hard Rock Café which surprised us. We don’t even have one of those in Perth and they had one in this tiny place. I suppose there were about 8 restaurants/cafes but only about 20 other shops. Definitely a tourist shopping facility as in there was no supermarket or anything. The shops were empty pretty much and the restaurants were empty other than the staff. One café, I think it was the Hard Rock but wasn’t paying much attention, did have a lot of people in though and there were 3 Fijian guys playing guitar and singing to them. Then we wandered back along the front (back? front? make up my mind!) of the shops and were accosted by several men asking if we wanted a taxi. One of them was a lovely friendly Fijian guy with a gorgeous cheeky smile and David told him that we were nearly ready and would be with him soon and I asked how much to Novotel Nadi so he thought for a moment and said $25. I was just checking as we had very little Fijian money left so I wanted to be sure. I decided that we may as well buy an ice cream as we’d bought nothing else and then we could call it our $50 ice cream as that would be the total taxi fare by the time we got back to the hotel. David looked in his wallet and we barely had $10 plus a few coins other than our taxi fare home so we went into the newsagent (LOL he had ice creams advertised on his window!) and looked at the ice creams. They were all $5.50 each but then we saw a little tub that said $3.95 so picked up 2 of those. When we went to pay they were $5.50 each as well but we went ahead anyway. 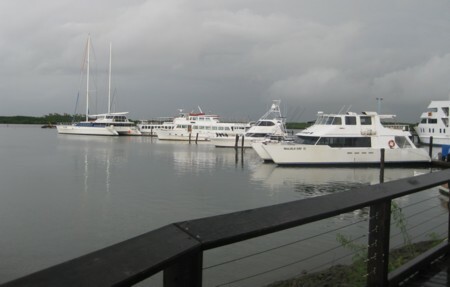 We found a sheltered spot under Jack of Fiji’s verandah to eat them and watch the rain and then the rain eased up and stopped so we were able to look at the outer surrounds of the shops. There was canal-style living behind the shops and even the waterway had a sign up saying ‘private, access to residents only’. Around from this was a large marina with some quite sizeable boats moored there. One really was an ocean-going size with 4 or 5 decks above the water but I’d still call it a boat rather than a ship. We’d seen this one sail by our island a few times so it was nice to get a closer look. Eventually we felt we’d seen all that Denarau had to offer, which wasn’t really a lot, so went back to see if the lovely Fijian guy was still there. David had taken him to be someone who would beckon a taxi for us and get a small fee from the taxi driver but as we went to him he said “Stay right there, I’ll bring the car!” It was a really nice car too, with seatbelts, so we put those on. We checked that it was still going to be $25 for the fare and he said yes. I laughed and told him he’d have had to kick us out before the hotel and we’d have to walk the rest otherwise. He did not take the deviation from the main road that the other driver had done but there was a little bit of roadwork in the spot we hadn’t seen before so I guess it was understandable that the other guy wanted to miss it. He was telling us how they’d had really bad floods and some of the shops had been knee-deep in water and had stock float away and this part of the road had been badly damaged. He told us that he knew where the Novotel was as he had worked there in the past as a security guard. All of the hotels seemed to be down long driveways with a guard house and one of those bars that go up and down to let cars through. They were only manned (should that be personned?) at night. When we got out of the taxi we gave him the $25 plus the remaining 50c we had to our name, he really had been nice and we’d have given him more if we’d had it.